Crispy Lady Alice apples top sweet cheesecake mixture in this #BrunchWeek pastry. Crispy Apple Cheesecake Danish has simple flavors that combine in this perfect, breakfast pastry. Are y’all following #BrunchWeek to see what all the bloggers have been sharing? I can’t wait to try some of these delicious recipes. Make sure you’re following along and don’t forget to enter the giveaway! There’s 6 prize packs to be given away at the end of #BrunchWeek. You could be one of the lucky winners! I don’t know about you, but I’m a breakfast pastry fiend. Yes. FIEND! Consequently, if there on the brunch menu, I have to try them. Apple, cheese, cherry, peach; you name it I can’t wait to try it. It’s the combination of crispy pastry with the sweet fruit or cheese. Mmmmm so so good. So, when I heard that Rainier Fruit was sending us some Lady Alice apples I knew I had to make a delicious brunch pastry out of those sweet, red globes of goodness!! Their flavor is perfect for baking, cooking, and, well, eating. I made some smoothies out of them, too. I was doing some reading on this type of apple on their website and thought I needed to share it with you. Did you know that these apples are a complete freak of nature? I’m sure they’re not too thrilled about me calling them that, but seriously, they are! They were found growing in Washington at an apple orchard. Mother Nature did her own thing and created this amazingly delicious apple. Gotta love Mother Nature! She knows her stuff! Since they’re completely natural, Rainier doesn’t really know which two “parents” make up this new baby apple. Amazing, right?? I had to share that with the hubs because it blew my mind! To think of all the cultivated varieties of fruits and vegetables; heck we even cross breed animals. It’s simply amazing to think that nature took its course in creating this fabulous fruit. It was perfect for this brunch pastry. Some apples will completely disintegrate, but these apples held their shape during cooking and baking. Which makes them perfect for this recipe. Because the last thing you want when you bite into the crispy pastry is apple mush. You want to bite into apple with a little texture and sweetness. That’s exactly what you get in this recipe. The pastry is super crispy and sprinkled with Dixie sugar before baking. There’s some sugar in the cooked apples, too, to make a nice sauce for the apples to bake in with the pastry. Dixie sugar is high quality sugar that I have in my kitchen all the time. They even sent me this nice silpat mat to bake my pastry on! Sweet, right? Sorry, bad pun. I added a little bit of the Nielsen-Massy vanilla extract to the cheesecake mix I keep in the pantry. Their extracts have the most amazing flavor! They were kind enough to send us some other flavors to play with and I can’t wait to make some rose water macaron when I get back from vacay. I’ve always wanted to make something with rose water, but never had any or knew where to purchase some locally. Now, I have some! I’m SO EXCITED! All of these lovely sponsors come together in this tri-fecta of a #BrunchWeek recipe that I’m sharing today. There’s a hint of all three so one doesn’t overpower the other. 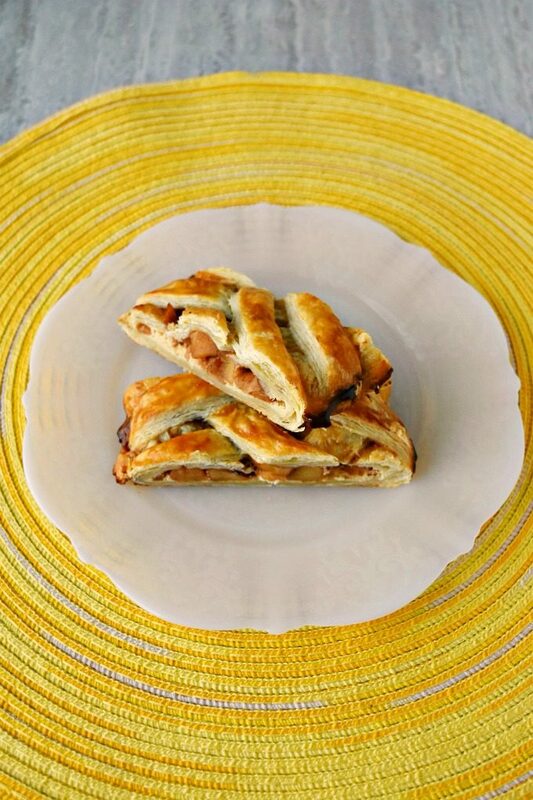 They all add a level of flavor to this crispy apple pastry that makes it the most delicious pastry I’ve ever had. Not made; HAD! Yes. This truly is the most delicious pastry I’ve had. Make sure you follow them on social media to stay on top of new products and delicious recipes made with their amazing products! Twitter, Facebook, Pinterest, and Instagram. Twitter, Facebook, G+, Pinterest, Facebook, Instagram, and YouTube. Twitter, Facebook, Pinterest, Instagram, and YouTube. What’s your favorite pastry at brunch? Have you ever had lady Alice apples? In a mixing bowl, combine the cream cheese, 2 large eggs, 1/2 cup sugar, and vanilla with a hand mixer (or in the bowl of a stand mixer). Set aside. Core, peel and chop the apple. Heat a medium non-stick skillet over medium heat. Melt butter in the pan and add the brown sugar, apple, cinnamon, and nutmeg to the pan. Cook over medium heat until the apples are soft the sauce thickens. Spread the cream cheese mixture in the center and top with the apple mixture. Carefully fold up the ends and then cross crossing the diagonal cuts across the filling to the other side of the pastry. When all the diagonal pieces are folded over, brush the pastry with the egg white and sprinkle with the tablespoon of sugar before baking at 350 for 20 to 25 minutes or until the pastry is golden brown. Cool slightly before serving or refrigerate and serve for brunch. This looks amazing. I had not heard of Rainier apples, just the cherries. Now I have to go find them! Thank you for sharing! I hadn’t heard of them either. They’re so good and perfect apples for baking AND eating. First of all, I love breakfast pastries too and yours is beautiful. Secondly, isn’t that cool about the apples? They just happened! That is TOTALLY cool about the apples. And that they tell the story of them on their site. I am loving these pastries! This apple version has me drooling. Thank you! I’m a sucker for anything with puff pastry on it. Well, I try. I think everyone should have cheesecake for breakfast.